San Angelo, TX— The San Angelo Lake View Chiefs closed out the regular season on a high note with a 35-20 win over the Big Spring Steers on a damp Thursday night. The Chiefs outgained the Steers with 372 yards of total offense to 361. Sophomore Albert Rodriguez finished the day with 241 yards passing and four touchdowns. Kendall Blue had 104 yards to his name along with a touchdown. The game started out fast. After a three and out by the Chiefs, the Steers scored on the very first play with Ethan Cortez finding Jeremiah Cooley for a 78-yard touchdown pass. The extra point was no good. Lake View came out and took advantage of a kickoff out of bounds by Big Spring that set them up on their own 49-yard line. Albert Rodriguez found Ahmad Daniels in the end zone for a 31-yard touchdown. This made the game 7-6. The rest of the first quarter was full of defense. Cooley grabbed an interception for the Steers and both teams forced two fourth down stops in a row. At the start of the second quarter, the steers got the ball all the way to the red-zone when Cortez threw an interception to Johnny Espinosa in the end-zone. The very first play after the interception Kendall Blue ran a huge 76-yard run. This led to a Blue touchdown from 3 yards out and the Chiefs to took the lead at 14-6. Defense stepped up huge for Lake View. 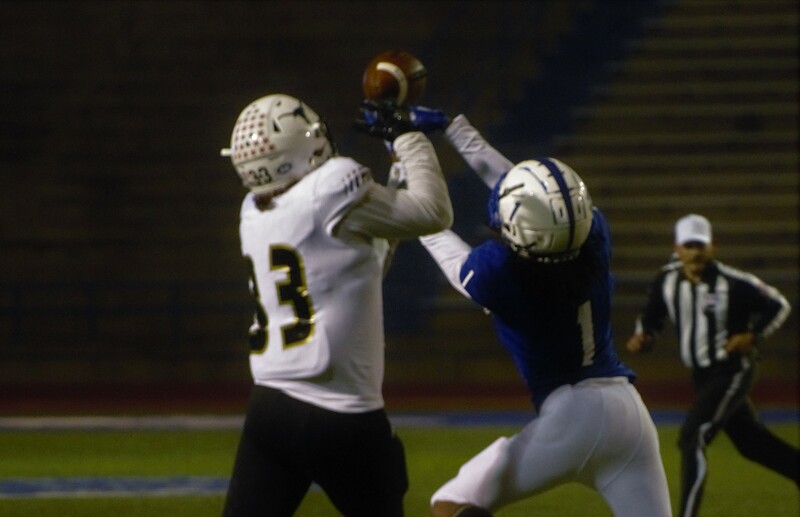 Rodriguez threw a second interception to Izaiha Valle and gave the ball to the Steers on the Lake View 23-yard line. The Chiefs stepped up for another fourth down stop. To end the half, Rodriguez threw another interception, this time to Zephaniah Nelson which he ran back to the 9-yard line. The Chiefs ended the half on a positive note, though, by blocking a last-second field goal attempt. To start the half it looked like the Steers were on their way to score a touchdown, but on a screen pass where they got 16 yards they fumbled the ball on the 15-yard line. After the fumble, Lake View continued to struggle on offense with a three and out. With an awful punt the Steers got the ball on the 34 yard line. Big Springs scored off of a one yard run by Cortez and the two point conversion was caught by Cooley to make this game 14-14. At the close of the third quarter, the Chiefs took advantage of Cooley's whiff on a punt, which set them up for a 17-yard touchdown pass from Rodriguez to Espinosa. This brought the score to 21-14. Espinosa started out the fourth quarter with an interception in his own red zone. Rodriguez didn’t take long to make the Steers pay The next play he threw an 82-yard pass to Ahmad Daniels to go up 28-14. After stopping a fake punt the Chiefs score another passing touchdowns for Rodriguez, but this time it was J.J Casaraz with the 9-yard touchdown. At the end of the game, Big Spring got a consolation touchdown to make the score look a little better at 35-20. Lake View (2-8, 1-2) will now face the loser of the Clint/Mountain View game in the Bi-District round.